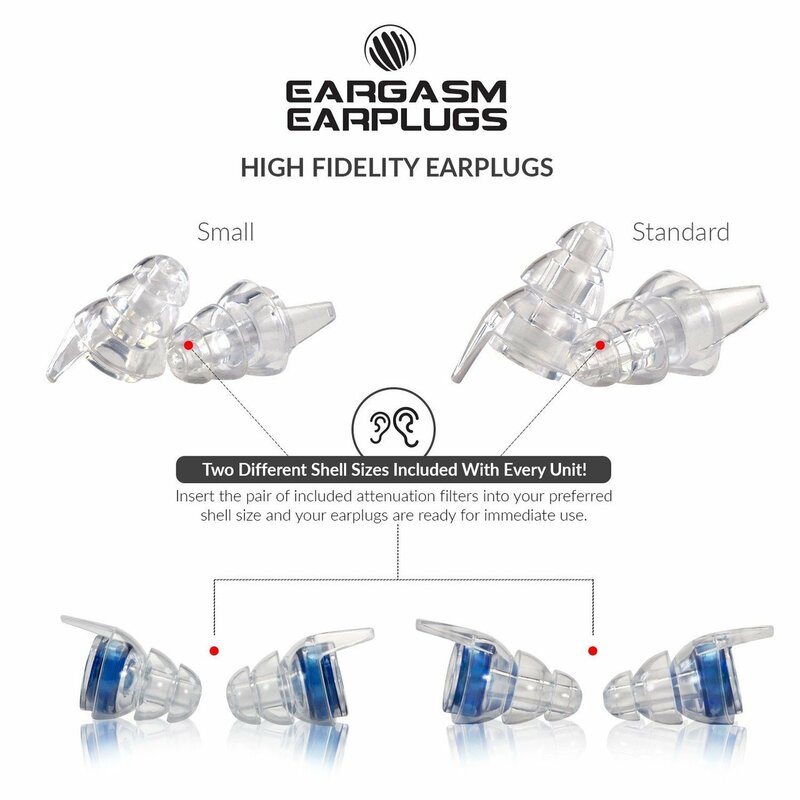 Using innovative attenuation filters, Eargasm High Fidelity Earplugs reduce noise evenly to maintain the full spectrum of sound while protecting hearing. eargasm.Noun. (plural eargasms) A sense of pleasure derived from listening to something, particularly music. A sense of pleasure derived from physical stimulation of the earlobe or ear canal. PROTECTION – Enjoy your favourite activities, without worrying about damage to your ears. COMMUNICATE – Keep the noise to a minimum, but still hear people talking and hear music with clarity. TWO SIZES – Every order comes with two shell sizes, so they fit every ear. DISCREET DESIGN – Almost invisible to others. EASY – To insert and remove, thanks to the convenient pull tabs. HYPO-ALLERGENIC Made with hypo-allergic soft silicone, so that you can wear them comfortably for many hours. FREE CARRY CASE – Comes with lightweight alluminIum case for easy transport. TRUSTED – By major music festivals. The earplug’s discreet, low profile and triple flange design comfortably fits most ear sizes. Every pair includes a complimentary aluminium-grade keychain carrying case so that your earplugs are always in easy reach. Whether you’re at a concert, a musician performing with your band, riding your motorcycle, or on an airplane Eargasm Earplugs helps you turn the volume down anytime you need it. Based out of sunny Southern California and started with the simple idea that in the 21st century, the simplistic foam earplug needed an upgrade. Foam earplugs are designed to completely block out the world around them. However, in today’s society there are so many situations where people still want to interact with people around them, just at a lower volume. Our earplug’s patent pending design solves this problem by filtering, rather than blocking out, sound to manageable level. With the patent pending innovative attenuation filters, Eargasms reduce noise evenly to maintain the full spectrum of sound while protecting hearing. Won’t muffle music or voices as foam plugs do.By using innovative attenuation filter technology our earplugs reduces noise evenly to maintain the full spectrum of sound while protecting your hearing. Music or voices won’t be muffled like with foam plugs. 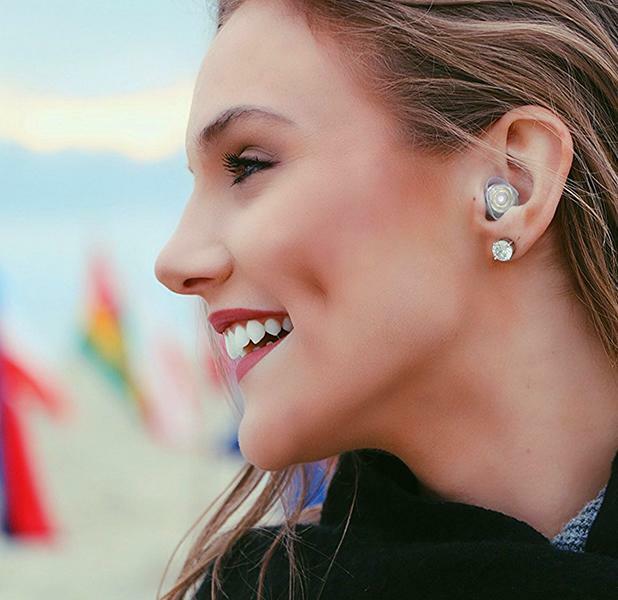 With a 16dB Noise Reduction Rating (NRR) these earplugs provides a significant drop in harmful decibels but allow you to so continue doing the activities you love while minimizing the risk of hearing loss. Protecting your ears harmful noise levels at loud events and cutting out excess sound from everyday life and your favourite activities. Eargasm have recently updated the Noise Reduction Rating (NRR) to 16 decibels, but depending on the frequency of the sound and if the earplug is properly inserted in the ear, users can reduce noise by up to 21 decibels. Additionally, the SNR (Signal to Noise Ratio which is used in all countries outside of the US) on our earplugs is 21 decibels. 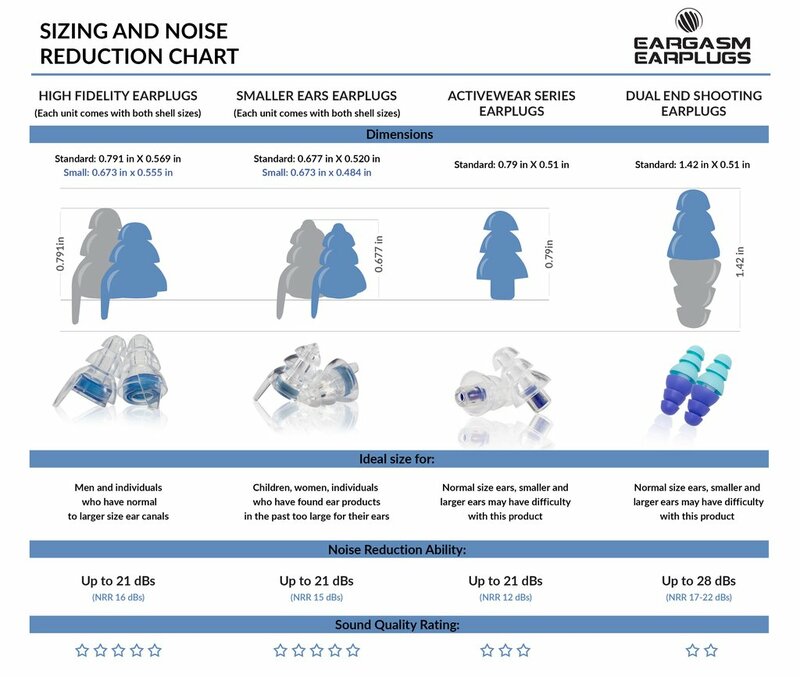 *** The NRR rating is federally mandated by the EPA and a label disclosing it must be placed on all earplugs, and we want to comply with this law, although we feel it vastly underestimates the true effectiveness of our earplugs and most audiologists find it to be an antiquated system in need of modification. Most high fidelity earplug brands choose to advertise with the higher decibel number since it is a more accurate reflection of the results consumers can expect to have with our product. We disclose the NRR in our product description and now hopefully by posting this answer people will be more aware of the NRR rating. 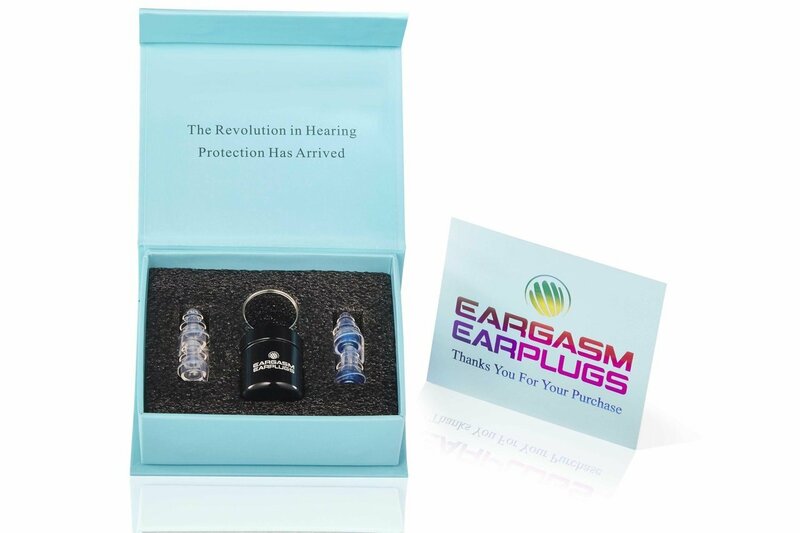 Now with TWO pairs of different sized earplug shells included with every order! Eargasms have a comfortable triple flange which fits almost any adult ear, effectively blocking out harmful noise. The clear silicone colour provides low profile for subtle use. Removal is easy with a slight twist and small pull on the integrated tab and they slide out with ease. Receive a BONUS aluminium carrying case with every pair of earplugs so that you can keep them in easy reach! The handy case is also waterproof with a rubber seal which ensures that your earplugs remain protected from moisture, dust and dirt. is over 35% shorter than competing brands for easy storage on your keychain. An anti-stick interior guarantees earplugs will always be easy to put in and take out. Made with a super soft, non toxic silicone makes for comfortable wearing & ensure they wont cause irritation, itching or pain from pressure in the ear canal. This means that they are ideal for all-day wear at music festivals, band practice etc. They are discreet, with a low profile and triple flange design that comfortably fits most adult ear sizes! How much sound is reduce by Eargasm Earplugs? The Noise Reduction Rating (NRR) on our earplugs is 12 decibels, but depending on the frequency of the sound and if the earplug is properly inserted in the ear, users can reduce noise by up to 21 decibels. Additionally, the Signal to Noise Ratio (SNR), which is another scale measuring an earplug’s effectiveness used in the rest of the world besides the US, on our earplugs is 21 decibels. A label disclosing the NRR is required under federal law to be placed on all earplugs for sale in the US, so you will see one prominently placed on our packaging. However, we feel the NRR of 12dBs vastly underestimates the true effectiveness of our earplugs. What is the difference between Eargasm Earplugs and regular Foam Plugs? The difference is in the quality of the sound that passes through the earplug. 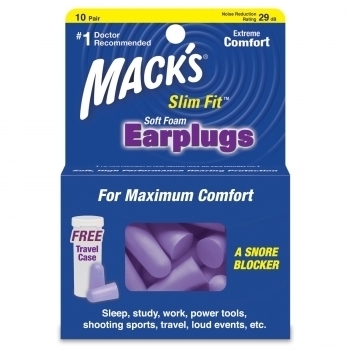 Foam earplugs tend to block all sound and muffle and distort noise. 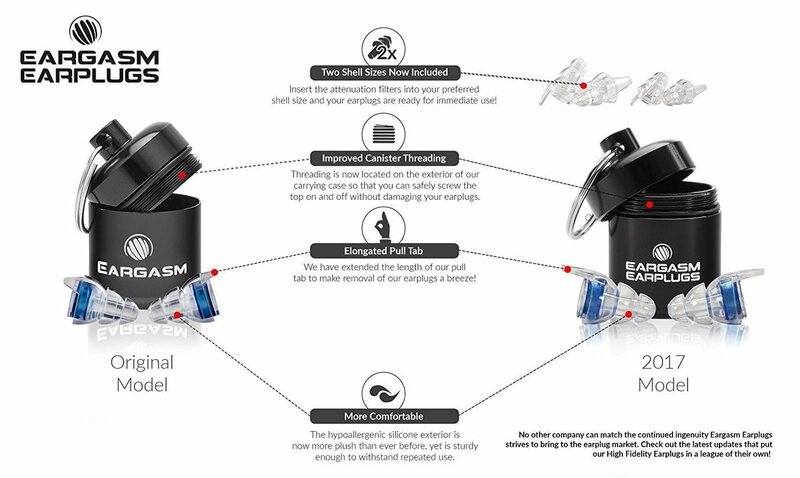 The beauty of the Eargasm Earplugs is that with a low NRR and the specialised filter, they maintain the full spectrum of sound for the wearer.The advantages of this difference are endless! Concertgoers and musicians can safely listen to loud music with clarity. Motorcyclists can reduce wind noise, but still be able to hear their surroundings.Factory workers can cut down on shrill noises in their work environment, while still being able to communicate with coworkers. 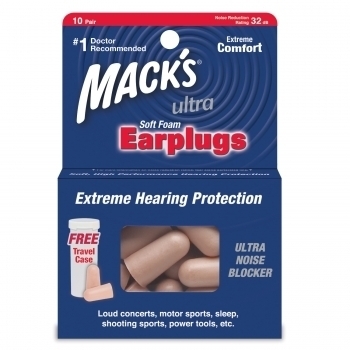 I purchased these to deal with the crazy loud music in my gyms fitness classes. I’ve since put them on my keyring and am carrying them everywhere. What I like is that you can still hear the music and people talking, it’s just as though I’m able to turn down the volume of the very loud world around me. I’ve used them in fitness classes and no matter how sweaty I get they stay in. I’ve used them in other loud places and find that I feel calmer without all of the loud noise of various places. I plan to use them in airports and on planes as invariably I get stuck in front of the crying baby or the loud-talker. I’ll wear them when my daughter is practicing the ukulele or piano, when the loud neighbors have their pool parties, when my husband snores, when the people in the hotel room next to me are making too much noise, etc. I wish I had owned a pair of these 30 years ago. Great product. Totally worth the money. I’m new to motorcycling. I used to play in bands though and I WISH I had these back in those days. I honestly would’ve worn these on stage. They’re a great alternative if a musician doesn’t have the money for expensive in-ear monitors, custom molded to their ears. I haven’t tried these in the music world yet personally, but I’d imagine you’ll still be able to hear everything well enough. If you’re a singer, these could still work, as they don’t give you that closed in feeling where all you hear in your head is your own dry vocals! I hated that, and that’s why I never wore earplugs while playing. Turn the volume down wherever you find yourself on the weekend. Whether it’s on your motorcycle, a noisy restaurant, or countless other environments! I suffer from hyperacusis and tinnitus and have difficulty tolerating noise especially in public places where there are a lot of people in smaller spaces such as restaurants. It drives me crazy to the point that I have to leave. I’ve tried different earplugs but a lot of them block too much sound and I can’t hear my partner talking to me and I become frustrated. at blocking the interuppting sounds and great that I can still have a conversation. I tried them for sleeping but they weren’t very comfortable when I was on my side. Sleeping earplugs 3 out of 5. Sound earplugs 5 out of 5. I would give them a 6 out of 5 if they were clear all over. Sound reduction targeting loud noises while allowing conversation is quite remarkable, transitioning from foam earplugs. Earplug is very low profile, hiding well in ear. Potential for discrete application across range of environments and situations is transformative. No problems receiving very prompt delivery from Earstore. Have recommended to friends who also suffer from ringing ears after a night out. Spent time going through various products reviews before I decided to buy this product. As a concert goer, I wanted to make sure my ears would be protected (from loud and heavy music) as well as being able to have the sound properly filtered. This product definitely delivers on these. Highly recommended. I work at a club in the city with very loud music. Every night when I get into my car to drive home I have ringing in my ears which lasts well into the next day. My ears no longer ring when I leave work and I can get to sleep without the annoying sound in my head. So happy to know that I am protecting my hearing. Would recommend them to anyone who works around loud music. I’ve tried other musicians earplugs and have found that they muffle too much sound and I find it hard to hear vocals. These earplugs had a lot more clarity and seemed to block a lot of the heavy bass while still allowing me to hear the vocals.